Rong Chen gave an on camera lecture to entrepreneurial students at Tsinghua University about the internet and blockchain. Rong Chen: Let me start by reviewing the history of computers, because I think there is an opportunity now. During this blockchain trend, we have the opportunity to rewrite history. To rewrite history, we must first know history. So, my main content today will tell you about history, and then talk about what the blockchain is, what the Internet is, and what it has to do with the blockchain and the Internet. My topic today is the six dimensions of blockchain + Internet. I think that looking at the blockchain + Internet from different angles and six directions, one can see this historical opportunity. What’s the History of the Internet? Let’s start with the history. It is at once a simple and complex story. In 1995, there was a browser called World Wide Web. Simply speaking, the browser had a URL link. When you clicked this link it downloaded to your computer. The browser displayed the data, and you could see it. Everyone knows that such a simple function has made a great impact on us. Imagine the computer before a browser is this red box. I will talk about it later. If we pretend this red box is a computer, there are two things on its hard disk. Two kinds of things exist in the world: one is called a program, and the other is data. When there was no Internet, data and programs had to be installed on the computer. So with today’s Internet, you will notice Google’s Instant Apps or Wechat’s Mini Programs. These programs can be run with a click of a button without needing installation. It is very convenient. Then, thinking back to our computer, if we just need to click to run a program, then we are also getting the data with a click of a button. Is there a computer science student in the room? Rong Chen: See if you can guess at these two questions. Let’s say you clicked here, and the URL data was downloaded. If you click on a program and it’s downloaded, can you guess at the difference between this Internet generation vs. the original generation. Do you think the difference is bigger, smaller or about the same? Rong Chen: This was once an engineering school. Now it is a comprehensive university. From an engineering calculus perspective, constants are functions. If we have only one thing on the hard disk, e.g. data and programs, what should we keep? We should keep the program, because keeping data won’t allow you to run anything. How does this data become a program and how does the program run? How do we actually relate this to the blockchain today? Drawing this picture is quite simple. I just want to tell everyone that sometimes the simpler things are, the greater importance they have. This picture, if it was not for Tsinghua University, I might not even bring it up today. There are two reasons for speaking about this picture. I drew these pictures when I was at Tsinghua University in 2002 and 2003. I used to have two laboratories on the third floor right when you enter the FIT building. We built an operating system and middleware center there. At that time I made these two drawings, and I also named the operating system Elastos. 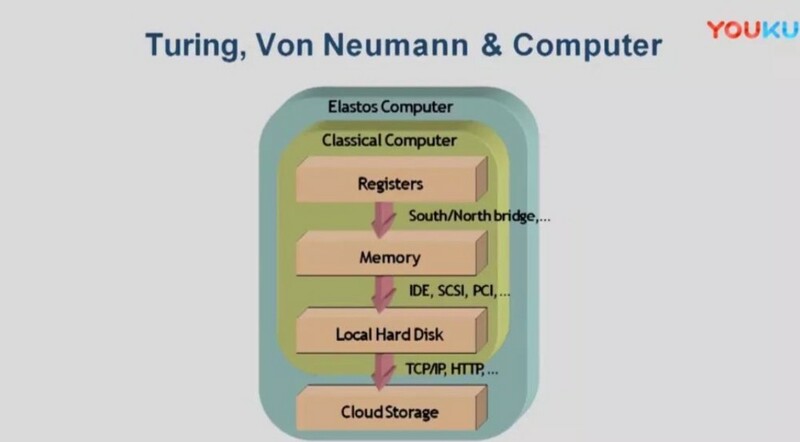 The yellow side is the von Neumann storage architecture in our traditional computer, with registers, memory, and hard disks. This picture was painted by von Neumann around 1952. In 1946, it was the first of its kind. Of course, it was later disputed whether it was the first one. This was because at the time, the US military made a highly influential computer, which was known as the world’s first general-purpose computer. Then a summary article was written around 1952, which devised a three-level von Neumann storage architecture. In other words, the hope was that computer speeds would be as fast as a register. It was hoped that the storage of a computer would be as large as a hard disk. At that time, it was not called a hard disk, but a magnetic drum. There was already magnetic storage. If you have the opportunity, I recommend that you go to Paramount, California. There is a computer museum there that is very educational. Of course, this has the fastest speed, and this the slowest; this has the largest storage, and this the smallest. We would hope that it is mapped out by level. In fact, there is no such storage architecture when talking about the Turing machine. Because the Turing machine is infinitely fast and the memory is infinite, with a Turing machine, there is an infinite amount of strips of tape. Of course, the paper strips are filled with an equally infinite amount of information. So what is the difference today? 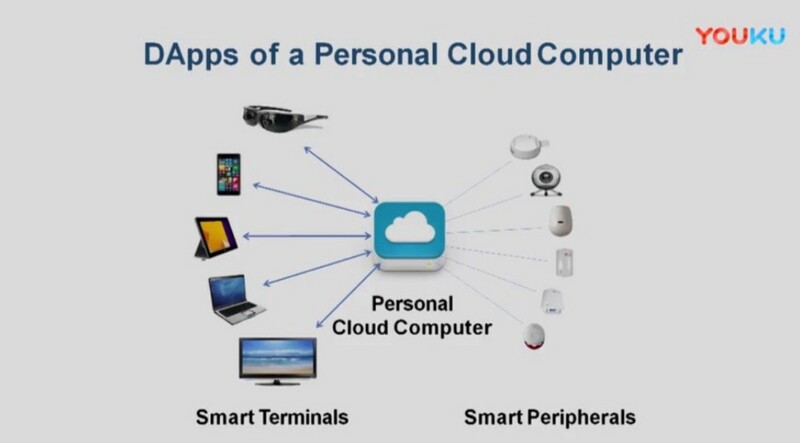 Because the Internet’s optical fiber is fast enough, we may be able to integrate cloud storage, e.g. 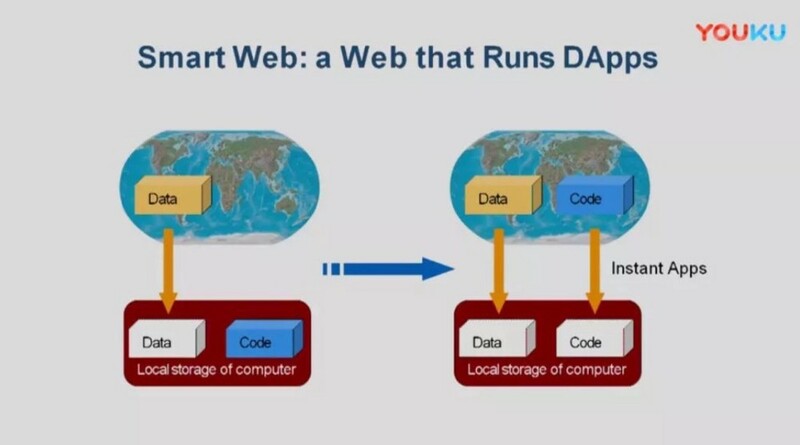 IPFS or personal cloud disk, into a personal computer’s architecture. Otherwise, this cloud drive will be placed on the edge as a backup. For example, we used to use tapes, but now use them as backups. The same goes for how we often use cloud storage as a backup. If you think about it today, we take cloud storage as an inherent part of the computer. Let’s not talk about this yet. This picture is also very important. It has several basic concepts. We just talked about if the cloud drive was used as the computer’s basic storage architecture, we can call this a cloud drive computer. It was once called a C drive computer. The first operating system was called DOS, e.g. a hard disk computer. Now that we have a cloud drive, as an architecture, we think of it as a computer. Peripherals at this time, such as cameras, doorbells, and printers, are peripherals. When we used to go to school, these peripherals had no CPU because the CPU at that time was very expensive. Does anyone still know what are serial and parallel ports? Serial and parallel ports were once just a few copper lines. The serial port had two lines that would transfer the information from the computer to the peripherals according to a time sequence. The parallel port is the copper line with discharge lines. The battery level had a life that could go back and forth sixteen times I believe. I forget exactly how many. Anyway, at the time the printer was connected to the parallel port, and the mouse was connected to the serial port. In any case, we have some students studying WE. After we combine the high and low batteries, there are relays, and when the relay is powered, the printer will get pulled across and an “A” is hit. That kind of printer was called TPY, and it was a remote printer. At the time, when your battery changes, as soon as it was pulled, it printed, and the printer would be ready. So what can we conclude from that time period? The printer at that time had no CPU. Where was the program control? It had to be installed on the computer side, which then led to a concept called the driver. Many computers today have drivers. I want to give everyone an intuitive feeling when drawing pictures. Today, we don’t need a driver anymore. Let’s draw up a conclusion. For example, inside a camera, there is a circuit board, which has a CPU inside. We all know that we can go asynchronous. What it means to go asynchronous is, I can ask my hard drive to read me a file, while my operating system can go do something else. When the hard drive finishes reading, it will give me a report that the file has been read. This is called asynchronous operation. If it’s synchronous operation, I have to run it myself and return it on my own. All asynchronous operations have a CPU. Because it can work on its own, where there is a CPU, there is a program. Because I ask it to go do work, it will have a process to do, so all places with a CPU are Turing equivalent. I’m going to talk about the first concept. The blockchain inappropriately exaggerates Turing, saying that all CPUs are Turing. But there is only one CPU running the program. That is the main CPU, because it has no speed difference. Why do we draw the terminals like this? When I was in school, we worked with a mini-computer. A mini-computer was probably as tall as me. Today’s standard racks are this wide, deep, and high. Back then, we had a rack called a DJS130. How much memory did it have? 64kByte magnetic core memory, with no Byte, and all read in through strips. At that time, it was the best computer China could make. It ran at 330,000 CPU commands per second. A computer terminal could have several serial ports on its motherboard, like the IBM 360. The main building under the large platform is Tsinghua University’s Computer Center. The center would later buy a mainframe when I graduated, which could take multiple terminals. Today’s PC is connected to a single terminal, and the same goes for a mobile phone. Back then, it could be one PC connected to dozens of terminals, hundreds of terminals, 128 terminals, 64 terminals. Terminals were called cathode video cameras. Like a TV, it did not have a CPU. You directly displayed A or B. This relied completely on the serial port’s battery level to run. Therefore, you have the concept of a drive. Today, these all have CPUs. Actually it is a two-tier architecture. At the computer’s physical connection layer, it is actually a network. This is a CPU, that is a CPU… all are CPUs, connected in a network. However, everyone is just looking at it from different angles. Looking at it from the physical layer, it is a network, but if you look at it abstractly, e.g. as a host, or a main storage, then it is a peripheral, or a display. Why do you think we describe them this way? I should take the time to briefly introduce a major event that happened last week, where Microsoft dissolved the Windows group. This event was almost not reported on by the Chinese media. Who here heard about this? Do you think that because Microsoft dissolved the Windows group, they are no longer working on operating systems? People say they heard this, but it’s just hearsay. What it means is that we have come upon a new trend, but people don’t know it yet. Today, I’m not being filmed on live broadcast, so I will take this opportunity to exaggerate a bit. If you look at it from the ground up, it is a network. Looking from the top is a question of opinion. Now it does not need a driver, so why do you still have peripherals? It is because today’s Internet of Things, today’s smart home, all devices can access the internet through your home router, right? That’s right. Your home router is a firewall, but while it keeps others out, it also can’t see outside. Similar to the one-way glass for a convicted prisoner: people can’t see inside, but you can see outside. With more sensors, everyone can see the Internet. The privacy of your home is completely exposed to the surveillance of these cameras and sensors. For example, we get news on the Internet. People’s home cameras broadcasts live video from their homes. Do people know this? They know. If you put Amazon’s smart speakers on your pillow, what do you think will happen? This isn’t a big deal really. If the China national grid and high-speed rail ubiquitous sensors can all access the Internet, they can do one thing called a tunnel attack, because the Internet used to be that if you give me an IP address, then the operating system was the “Railway police.” An operating system manages only one piece of hardware, so if you want to go online, who manages it? Either way, the operating system doesn’t manage it. The operating system only provides one thing called a “socket” in English. This is the socket of the power supply. That is, it only provides a port for Internet access. It means that to go through this hole means you’re going online. The operating system does not control where you go. You can go wherever you want, which resulted in many sensors going to a site called DYN. On December 10, 2015 in the United States, millions of cameras and routers went to the DYN website, which resulted in half of all US Internet sites being completely paralyzed. Because the DNS wasn’t able to solve this issue, this basically paralyzed the Internet. Three months later, the same virus visited Germany and all of the German Internet collapsed. In other words, today, as long as you have enough sensors, no country has any resistance. There is a sentence in English, “Those who have capability without intention, those who have intention without capability.” If you can imitate a sensor even better than a real sensor, then no country would be motivated to attack the Internet. Those who want to attack the Internet in the world are not able to imitate sensors to such an extent. Do you understand this sentence? Who is able to make a perfect sensor imitation? I can think of several big countries that can. Terrorists want to do this, but they can’t. Those terrorists who want to attack the world’s Internet have the will but not the ability to do it. Capable countries do not have the will to attack the world’s Internet. This basically means that today’s Internet is “naked.” The world’s Internet is “naked.” This is actually a very, very big thing. Research and development on the stand-alone operating system UNIX began in 1969–1970, and it is very mature today. This kind of “railway policeman” does something like this. The physical layer operating system has little room for improvement, so Microsoft will not do it. So what did it do? Microsoft made a thing called a universal app.. For these terminals, a program can run on glasses, mobile phones, tablets, computers, TVs, and game consoles. Obviously, this is a bit of trick, since all computers are X86, and 99.9% of phones are RM CPUs. At this time, a program can cross CPUs and X86s, and can cross languages. Programs can call and inter-operate with each other. Windows 10 has already reached this level. Microsoft is the operating system that can reach this realm today. Of course, many people look down on Microsoft. It’s similar to how everyone looks down on Xerox, today. Because Xerox hasn’t died, it has completely disappeared. Back when I was in the United States in 1984, Xerox invented Ethernet, Xerox invented Windows, and Xerox invented object-oriented programming. In 1984, when Xerox was in full swing, today’s three major inventions in the computer industry came from a laboratory. It wasn’t beautiful, so it died. In 1984, I saw Xerox’s Star Workstation in a store when it sold for $14,000. All those zeros were an astronomical amount to me. At the time, a PC for $2,000 was also too much for me. But no matter what, $2,000 is still 7 times better than $14,000. At 7 times you think, if you say that the car was $5,000 at the time, then a house was $100,000 at the time, your wife is not likely going to let you buy a computer. Then you try to tell her that two years later it will be half the price, and you can just forget about it. Therefore, it obviously did not sell well. But Xerox knows what Windows is, knows what a network is, knows what object-oriented programming is, so why didn’t it cut prices? Because Xerox would sell $20,000 printers at a profit of at least $2,000. Selling a $2,000 PC can only make $200 in profits, after adding in the hardware and labor costs. Because of all kinds of capitalistic evils, the stock market led Xerox to focus on the printer, persisting in its own market until its death. Today, Microsoft is transitioning. I won’t comment on whether it can win after its transition, but when it was at the top, Microsoft did very basic research and development. So I hope we can begin here. Students, I implore you not to just look at the top companies, and do not just focus on the losers and winners from the Microsofts of the world. For example, who can make such an APP? There is only one company today, although this company is not that good. The follow-up sentence is, my Windows 10 will never have Windows 11, because my Windows group has disbanded. This sentence is also what Microsoft said in 2005. What does this sentence mean? People say it is just bragging, how can there possibly be no next edition? It’s because you disbanded, so you don’t have what it takes anymore. Because you are almost dead, so there is no next edition. Wherein lies the problem? If you are an Internet of Things network, if you are peripheral computing, how can you predict the version of your peripheral equipment? That is to say, if you take a mobile phone into a house, can you use the home projector. If it was the original Windows 7, it would demand Windows 95 or Windows 2000 to upgrade the driver. If it is the Internet of Things or a cloud operating system, can I demand the website to update with me? Can I ask the projector in this room to follow me? If I take a new version into the room and ask the projector to upgrade, if someone brings an old version in, does it require the projector to degrade? Thus, from now on, Windows 10 will not have Windows 11. Talking from the point of view of a network operating system, I will always be able to adapt to the surrounding services, and no longer require peripheral websites and devices to have a version number. What will be the significance of this event? This has been talked about for many years, but was hardly reported on in our media. This is a snobby point of view. Why is there a driver? After I graduated, I went to Lenovo Hanka Laboratories in 1982. The speed at which people typed, especially documents written by native English speakers, was faster than the floppy disk input at the time. Therefore, when the machine was turned on, we had to consult daemon behind the scenes, because it was necessary to cache some of the data in order to follow the user’s type speed. To make the type bold, we made Hanka in order to keep up with people typing. When surfing the Internet, because the operating system has no access to the Internet, we had to write a web application. We had to write a web service because the operating system was not responsible. Therefore, when the computer started, it had to open a daemon. It’s just like if you go to the front desk of a hotel and ask for someone to assign you a room, or you go to the supermarket and ask someone to help you check out. First, you look for the daemon, then the daemon creates a service, and that service helps you. This triangular structure has led to today, when you start the computer, there are a bunch of applications and services running behind the scenes. Who is eavesdropping on your privacy? It’s just like if when you opened your home or turned on your computer, there’s a group of people standing outside your door saying we are good people. We won’t listen in on your home conversations. Actually, they hear everything. So, those people who ask you to let them visit your address book on your mobile phone, everyone has copied your address book and stolen it. Almost 100% of privacy leaks and viruses came from the daemon. At this time, can we not make a machine without daemons? Why can we not make a machine without a driver? For example, Microsoft’s operating system often has blue screens and crashes. Why does it crash? The crash occurs because the system program inside it is actually decades old. This kind of stability is not perfect, but it is still okay. However, as long as third-party code was installed onto the system’s driver, if the third-party code crashes, then the entire system collapses. Therefore, most of the system crashes come from drivers. Most of the privacy leaks come from the driver and daemons. It’s like someone is drilling into your system, and it listens to the system. Then, it tells a collaborator, and that collaborator sends this message back to its server. Do you understand? First of all, the driver is a ghost. Whether it is crashing or eavesdropping on your privacy, it is the driver doing it. And on top of that there is a living person. That person is called a daemon. Then it wants to send the message out using TCP protocol. So we should make a virtual machine to void these three things. On the virtual machine, there can be no driver, no daemons, and no direct access to the network. This is what we have been working on for seventeen years. Of course, we have taken a lot of detours, but let’s not chat about that. At this time, let’s talk about what the blockchain is. Blockchain means that we have a computer to keep accounts and stop fakes. For example, in order to stop someone from being able to secretly exchange books, we call on many people to do account checks together. I’m going to talk about a few basic concepts. The blockchain is a distributed system, or a decentralized system. We, for example, have a total of 6000 nodes, or 10,000 nodes, or about 10,000 Bitcoins. How many books did 10,000 bookkeepers record into? An accounting book was created. That is, 10,000 people recorded 10,000 copies at the same time. But it is still one book. I’ll get to the final conclusion now. If we look at 108,000 miles of road, from a higher level perspective, isn’t an accounting book a computer? This computer only recorded one book, but this computer was more credible than a conventional computer. From a macro perspective, we can say this computer has certain qualities. This computer can’t be shut down by anyone. No one can keep fake accounts on this computer, and the computer will keep an accurate record book. A database of books can not be called. You must read and write to the database, and a book is a liquid account. What is a liquid account? China does not really use checks. Checks are only used abroad. For example, San Zhang writes a check for Si Li, because he wanted San Zhang to have an account. Si Li has an account, so he sent over some money bit by bit. Then San Zhang signed for the account. When Si Li receives the check and endorses it, and then once again signs for it, the bank will finally cash the check. This is one row of liquid accounts, so how many lines can be recorded in 10 minutes? The average line is about 250 bytes. This account is not easy to tamper with. A new page is turned every 10 minutes, which is 4000 rows per page. Let’s take a look at the speed then. 4000 rows in 10 minutes, which is 600 seconds. 4000 divided by 600 equals 6.66. Some people say that the blockchain is very slow. You can’t even do 6 calculations in one second. 4,000 calculations in 10 minutes is a bit more accurate, on average 6 transactions per second, because it is impossible to send. Then, the first book may not be credible. So it will take at least a few more times of 10 minutes to confirm that the first 10 minutes were reliable. In this way, you’ll be up to an hour at least. If you are eager to move your money, this hour will be costly for you. What is the History of Blockchain? Let’s talk about the history of blockchain. If no matter how many people record, they are recording into an accounting book, then from a higher level perspective, a book does not have decentralization. Our students at Tsinghua University still learn some basic logic. For an accounting book, what is called center, what is called not center, and what is distributed? When I was in college, I went to the United States to work on a distributed system. At that time, the distributed system was the same as today’s computer industry. That is to say, one person works too slowly. For example, if I ask Baidu to search for Tsinghua University, it may call hundreds of thousands of computers at the same time. To get today’s news about Tsinghua University, one computer is too slow. In reality, these hundreds of thousands of computers work together. You search for part A, you search for part B, you search for part C, Tsinghua University will search for the weather part, you search for the academic part, and you search for the sports part. After the division of labor, we had our news.. Therefore, from the point of view of the production of distributed systems, it is division of labor that speeds things up. Then distributed systems is talking about slowing down. No one will remember 6,000 personal account records quickly. Do we believe this? This is the conclusion. 6,000 individuals recording without one recording quickly. This is the theoretical limit. One person using one computer can’t solve the problem of the Internet. So we will talk about TPS in the blockchain today. Where do we talk about TPS? People don’t worry about their computers these days. When you install your computer, you ask the boss at Hailong Tower how fast is this CPU? Have you experienced this? Boss, what memory does this computer have? Boss, is your CPU 1G, two core, or four core? Four core working separately is faster than one core by itself. This is to say that the four core are slower than the one core. Speaking of TPS, when will people start to ask, how many TPS is the Internet? The Internet does not ask about TPS, the operating system also does not ask about TPS. The operating system is only loaded with a certain number of TPS. We only talk about TPS when there is so much CPU speed. You wouldn’t say how many TPS per second is Microsoft’s Windows? So which machine do you want it installed onto? Installing on the phone is still installing on the cloud. If you don’t install it yourself, then you wouldn’t ask how many TPS, right? We have no reason to belittle others, but this is a basic concept. Because many people say they work on a blockchain operating system, but they also talk about how many TPS they are. You understand what I mean? This is contradictory. Then they talk about how fast they will become. You’re almost to the limit, but you can’t even reach the limit. Your limit is the speed of a computer. Can you put applications on it? Can you provide services on it? How many people can one computer actually service? This does not require Tsinghua University students. It’s even too easy for children. Kindergarten children will understand this doesn’t make sense. But people are seriously evaluating these companies and still throwing money at them. A blockchain is an accounting book. Of course, you know that I didn’t research the information code too much. But I am of a certain age, so I can speak a few words about it. How many lines of code did Satoshi write? Does anyone know? Satoshi’s first Bitcoin came out in 2009, and he probably wrote 50,000 lines of code for it. The 50,000 lines of code are great and very clever. This was the first time that a computer was made that was not controlled by one person or an organization. From 1946 to 2009, all computers were controlled by one person or one organization. Satoshi’s invention is quite spectacular. At the time, the computer was not Turing Complete. Even if it was Turing Complete, it could not be used to run applications. It could only record accounts. There was hardly any hard disk space in this computer. In other words, this computer could only record San Zhang sending money to Si Li, including when it was transferred, signature, the reason for transfer. Then the liquid accounting continues down its path. You can’t play songs, you can’t play movies, and you can’t play games. Then, you make all 10,000 nodes synchronize together. In nine years, from 2009 to 2018, the amount of arithmetic needed to keep these records each minute of each day would be about 150 Gigabytes. 150 Gigabytes isn’t a big problem on today’s hard drives because today’s hard drives are slowing down and increasing in capacity. In nine years, you would think that hard drives would be even bigger. On the contrary, it averages six operations a second, which is not even a MegaByte. That is about 10 MegaBytes in 10 minutes, which means it increased by 10 times. Today, it is not 150 Gigabytes, but rather 1.5TB. Does everyone know how long it takes for 150GB to synchronize across firewalls? 150GB synchronizes for two weeks, I put four computers, two succeeded, and two failed. For 150TB, synchronization does not finish, understand? If you tried 1.5TB, all four computers would be unsuccessful. So, this is simply not a matter of speed. Is it a matter of speed to complete one MegaByte in 10 minutes? This was Satoshi’s intention. Let’s discuss the six dimensions. In fact, it has nothing to do with applications. The first one is that this computer is running automatically. No company nor organization is working behind the scenes. Because of human nature, it is necessary to give each person a reward, which will keep people mining without end. Originally, you would get 50 Bitcoin for mining for 10 minutes. If you go 4 years, you get 25 Bitcoin, and another 4 years, you get 12.5 Bitcoins. Nowadays, for 12.5 bitcoins, an average of 10 minutes would be 100,000 U.S. dollars. For these 100,000 US dollars, the world’s miners are divided. If it’s 3 people mining for $100,000 per 10 minutes, then that’s amazing. But if it’s 300,000 miners, then it’s worthless. So it’s an economy and miners fluctuate, with different mining speeds. People are desperately trying to speed up the efficiency of computer mining. This is a simple principle of economics. These people are subjectively for themselves and objectively for others. Who can understand what that means? Few people know that when we were in school, there was a person named Xiao Pan. In the China Youth Daily, he said that “Lei Feng was a subjective person and he was objectively someone else.” This led to a very big debate. At that time, China was still very open. These things could all be discussed. Today when it comes to this, these miners are subjectively for themselves, and objectively bringing order to a network that is seemingly out of control. Why is this great and interesting to us? It was because three things happened in 1967, 1969, and 1970. In 1967, a coding language was created in Europe. For the first time, an object-oriented idea was proposed. Then, after thirteen or fourteen years, the object-oriented technology was basically mature. The inventor was Alan Kay, who received the Turing Award for this work. The second invention, one was Arpanet and one was UNIX, was invented by Bell Laboratories, which was awarded the Turing Award. The third was the Internet, which was invented by UCLA. After 14 years or so, in the early 80s the object-oriented C++ language was born. UNIX was created, and then the name was changed to the Internet. All three things were done in the late 1960s and all won Turing Awards. At that time, the design made a huge contribution on the world. The U.S. military-sponsored network was called Arpanet. It was a setup similar to NASA. The US discussed whether it was necessary to set up a network bureau to be controlled by the U.S. government and military. Because the inventor at the time was a university professor, he insisted that it should be open source, and not be controlled by any agency. Therefore, it was decided that there would be no operator and no central node. This time led to the flourishing development of the Internet. Because anyone can intervene, anyone can access the Internet. But because there was no operator, problems came up. Thieves and terrorist attacks happened, piracy was everywhere. This occurred because no one is in charge, so there are vulnerabilities. Anyone who says I can strengthen this network is bragging. So what is the answer? How can we make this Internet have ID’s, wherein the operator sends you an ID first thing. For example, China Mobile would send you your mobile number first. Because there were two choices at the time: one is a packet switch and the other is one cell phone to another cell phone, establishing a virtual channel. So, P2P is to find a virtual machine using another virtual machine. To build on today’s Internet, the first thing is to send an ID. If China Mobile sends the ID in the United States, then Americans will be upset, and so will Chinese people. So who sends it? Blockchain will send it. Anyone can apply for a wallet ID in that blockchain. People can send you Bitcoin to your wallet ID. If I want to send you a Bitcoin, it may be impossible for others to accept it. If this ID on the Internet is mapped to all virtual machines, and these virtual machines have IDs, then the mapping speed will show the account is true. It will read from this, and after reading this and adding it to the cache, then reading speed will be very fast. Because it believes this accounting book is true and then believes in its own database, but where did it come from? It was copied from that record, created a database, accessed the ID, and believed these IDs were true. Did you ever think that when we learned the Internet, we were still using a floppy disk. The computer did not have a hard disk. This was in 1984. At that time, there was an Internet, where did we put the IP addresses, and where did the DNS resolve? For example, the DNS server, where did we put the mapping? So there was the DNS server, how many domain names are active today? Can someone give me an approximate value? The world’s registered domain names are about 100 million, and the number of live domain names are about 30 to 40 million. So many registered names are unused, which include those in English, Russian, Japanese, and French. Google.com is mapped to a four-byte IP address, in order to make it easy to read. Of course, some people will make a long name just to make you guess. But is an average 20 characters in length long enough? It is. Then we map it. Because the IP address is four bytes, so 25 bytes is one mapping. 20 is mapped to 4. 40 million times 25 is how much? One Gigabyte. Let’s randomly take out a cell phone. Does it have a Gigabyte. What can one Gigabyte save you? You immediately know that google.com’s IP address does not use DNS. So is DNS useful? At least in a large number of circumstances when it can be optimized, then it has no use, so we then see many problems. Is there really a need for a driver then? No need. Is there a daemon today? No need. Is it necessary to have the virtual machine access the port directly today? No need. Is there a need for DNS today? No need. How should a network be designed, how should one write a virus, and how can one create a network attack? The service running in this virtual machine, and the application running in this virtual machine cannot access the Internet. It cannot generate a daemon, and it can not install a driver. If it stole something, where will it send it to? A virtual machine runs only one application, so whose data will it steal? So, the future of operating systems is to run many virtual machines on one computer, whereas the past was running multiple tasks on one computer. If you can run 10 virtual machines on a computer, the application inside the virtual machine does not know the distance. It does not know how far away it is from the application and how far away it is from the service. These two virtual machines do not know whether they are installed on one machine, or on both sides of the Internet, the Internet of Things, or this LAN router. The difference between running 10 virtual machines or 100 million virtual machines on a computer lies in the power of the computer. That is the true limit. Logically speaking, both an Internet and Tencent’s Wechat can run 500 million virtual machines, right? Tencent is an especially powerful network computer, but all ID numbers are issued by Tencent. If it were a blockchain, it would not be controlled by any company, so such an Internet could become the communication platform for people around the world. The speed with which it ships IDs is not important, but rather that it can make this Internet a fair and safe global hub. This is a great thing. But the blockchain itself can’t be done because the people love to see it. What is an APP? APP is what normal people see and feel. The program is called APP. Everywhere there are CPUs, there are programs. Our computers are turned on. Sound cards, network cards, hard disks, mice, and keyboards all have programs. People don’t know what these programs do. In fact, you don’t really need to know that they do. So what does the blockchain look like in comparison? You only need to know about the IDs. Is it really necessary to know who sent it and how? As long as a few hard-working people make it happen, do we really need a ton of entrepreneurs? So many people trying to be entrepreneurial in this small space, is there really hope? This is a big thing. It’s true, no one has a chance. Am I right in saying this? The second dimension is it has another use as a book of records. Why would I send you 100 Bitcoins? Why would I send you ten thousand Bitcoins? Am I laundering money? The minimum unit of cash is a penny. Imagine I write a check for a penny and go to the bank to deposit the penny. The bank has no reason not to accept, because a penny is the minimum standard for the legal currency. Then I will deposit it. No matter if you let me deposit it or not, I have the money and am willing to pay the fee. If the bank requires you to pay $5 for a one cent deposit, would you pay it? I would pay it. Firstly, let’s ask if we can deposit one cent when you pay $5? Yes we can, but why should I do this? Because when I deposited this check, it had my signature and the recipient’s signature. Whenever anyone goes to the bank to check your account, you can see this one-cent check was deposited in a certain month. Well, as a company, I want Party A to send money to Party B. I’m carrying a suitcase full of money. Don’t worry if this legal or not. Anyway, I’ve brought in a box of cash, a million in it, and the movie goes on. I get up and leave. I walk to Party B and send him a million. Then we both meet at the bank. You and I both sign the one-cent slip, and deposit it in the bank. The two of us contracted with each other and said that due to something on a particular day and a certain day of the year, Zhang San will give Si Li a million, and Si Li signed for the letter and received the letter. This contract is used as a hash. The hash is stored in the check that was written. The banker did not know what it was because it was a 256-digit string of 0’s and 1’s. Only the two of us know that we have a contract, and when you see the stamp on the check, it happens to be the hash. I have a copy and he has a copy, and we both go our separate ways. I report to my boss that the one million has arrived. How do I prove it? When he goes to the bank to check, he sees the dollar is there. The hash is also there along with the receipt, so my boss believes me. So, this penny is not necessary to connect with money laundering. I don’t need to send him a million dollars at the bank. I sent him a million behind closed doors, but my boss believed me. This is called trust. Of course, many things can be analogized. I am not trying to give an example of money laundering. Isn’t this like $100,000 every 10 minutes? If you’re a Chinese mine owner, I’ll give you the equivalent of $100,000 in RMB; if you’re a US miner, I’ll give you $100,000 in US dollars; If you are a Japanese mine owner, I will give you a 100,000 in Japanese Yen. The owner of the mine is happy, subjectively for himself, objectively for others. And they made some money, so they are good. Then every transfer of money is a penny. It is impossible to launder money because you can’t take the million outside your country boundaries. Even if you try to fly or take a boat, you still can’t pass the money. At this time, each one of you traded a penny, but whoever is doing business in which country is very clear. This is actually the trick to Bitcoin anti-laundering. It is not necessarily related to money laundering, but because it can buy Bitcoin on both ends, you can really send a million, and when it hits the e-wallet, the cash is actually there. This is called money laundering. We do not need to link blockchain anti-money laundering to this mining. Let’s say I wrote an article on the Internet or made a movie. After I finished my 120-minute movie, I put a hash on it. Say someone cut 5 minutes or 3 seconds from it, then I took that person to court. At a glance, this 3 seconds was exactly part of my 120-minute movie. Then you went to check which year and month my movie was made. I made it before the cut, so his was the pirated version right? Even if there is no lawsuit in court, I still have a moral high ground, no problem right? The internet is cleaner than this; otherwise, we couldn’t tell who is real and who is fake. So, to be pure is to make a hash. Don’t make it more complicated than that. Young people in their late teens or twenties are starting their own businesses. Investors are giving these kids money, which is an opportunity to grow for these kids. What are these investors actually investing in an IT company? In fact, it is just as simple as saving a hashed blockchain. The rest isn’t even blockchain, right? The blockchain is great, but it’s not that great. The majority of entrepreneurs don’t offer anything new. Thirdly, what does the blockchain do? Since the blockchain fills a page of a record book every 10 minutes, it must have a first page. That is the creation block. Of course, Bitcoin says that the number of my Bitcoin in the creation block is zero. It generated 50 coins every 10 minutes, and this went down to 25 after the first 4 years and now 12.5 are generated every 10 minutes. This will keep on decreasing by 50% every 4 years. It follows this rule. In fact, we can ask if mining ends in 2040, how many will there be afterwards? Let’s say over a trillion. For every 10 minutes, this account book will be called by San Zhang to Si Li, then to Wu Wang. Some coins were buried in the earth into a steel pot. Nobody can reach those coins in the earth, but that doesn’t mean they aren’t there, right? If you change your hand every 10 minutes, even if someone tries to steal one portion of the money, the accounts won’t add up, so you won’t be able to fake it easily. And you certainly wouldn’t be able to give any details. By the same token, can 10,000 copies of books and 1,000 copies of movies be circulated on the Internet? I’m looking for a few nodes here to do a test, and then someone just remembered to send 10,000 books and a thousand bottles of water. Business school people are paying attention now because it has to do with money. Business schools talk about what is a commodity. I am an amateur when it comes business matters, but I do remember two things, one is necessity, and the other scarcity. Breathable air is a human necessity, but the air is not scarce, so I don’t have to pay for it. If it’s not a necessity, I would not pay for it. For example, I want a specific mobile phone. It must be scarce. Because of the culture that has lasted for 5,000 years from the agricultural era to the present, everyone has been increasing their productivity, slashing cultivation. Starting from copper, to iron, and then steel. People will not ride in cars, and then switch back to horses. People won’t ride horses if they have cars. If we don’t have a car, let’s build an airplane. Productivity will always increase. Let’s calculate the limit. When we reach the limit, we have a tremendous amount of material. I want to have this one and get it cheaply. It should be allocated on demand, and I want to be able to divide it. What is on-demand distribution? Being able to re-distribute software through re-engineering according to need is on-demand distribution. Therefore, studying computer science is sad. There is no difference between mental labor and physical labor, in which application writing is called being an “IT migrant worker.” Or now migrant workers are not as good as “code farmers.” There is no difference between mental work and physical labor, and there is no difference between urban and rural areas. It doesn’t matter where you stay, you’re just writing programs anyway. The material is abundant. You can go copy it. When we learn software, we naturally live in a great and harmonious society. However, everyone is still very hardworking. Therefore, the people who study computers are different from everybody else. The reason for learning about machinery is that I work hard to increase productivity; if I studied chemistry, I would increase productivity; if I wanted to learn computers, I would migrate to efficiency. Learning how to go back to our roots is the best. Therefore, people who study computers must do the opposite. How can I create scarce virtual goods? Don’t create something that is abundant. If something is scarce, I can sell it. I have 100 e-books, remember. The birth of Bitcoin in 2009 made this possible. It was impossible before, because everything was able to be copied. Now that Bitcoin has arrived, we can possibly create a smart economy or a private economy based on the blockchain. Today’s Internet has no private economy. When we were in school, China began to reform and opened up. We graduated in 1997. In 1982, there were more than two dozen students who went from the school to the city Shekou. At that time, we drove military trucks into Shekou, pitched tents, blew up the mountains, and built today’s Shekou Industrial Zone. Today, we see the changes that reform made for China. At the time, we had enough of suffering, so we went to the United States. Looking back, we still respect that generation, and many people have been a “cunning cow” for a lifetime. Today’s Internet is in e-books. For example, I bought a paper book on Amazon. This is my private property. After reading it, I sell it to my friend for half the price. For example, I bought a book on calculus, and once I finished learning, I can sell this book to a student for next term. But I bought an e-book, sad reminder, e-books are not cheap. If I buy an e-book on Amazon and want to sell it, I can’t sell it unless I tell the student the password. If I buy a paper book, it is my private property. I want to buy an e-book, but it is not my private property. By analogy, today’s Internet has no private property, only an oligopoly. Well, if we can remember how many books you have, we may create a private economy on the Internet, but we all ignore one important point: as long as we keep accounts when it changes hands, it will be fine. Any exchange of digital assets faces the execution of a program. The execution of a program depends on the execution environment, which is also called the operating system. Therefore, today’s smart contracts must be escorted by an operating system. This is a basic principle for everyone. However, in today’s Internet of Things and blockchain entrepreneurship, many people say if I can compute it then I will remember it. I recorded a Chinese copyright, so I will remember it. First, on such a rotten computer, can you really record a Chinese copyright? Second, you recorded the copyright, but a fake copy was created on the side. So what is the use of a copyright? Therefore, most of the blockchain startups today are futile. We spoke about the ID, the second is deposit verification, the third is scarcity, and the fourth is consensus. Today, all Internet websites are controlled by a single organization or institution. Can we have a website with supply chain finance? There are several checks and balances in insurance. With a smart contract, everyone signs it. This matter is recorded in a record book, right? This smart contract is signed on a website like Amazon.com, Softbank, Alibaba, or Tencent. But such a small contract does not need 6,000 hard-working miners to verify through decentralization, right? Who cares about supply chain finance? If you don’t believe him, you just record it. If he doesn’t believe you, then he will record it. But these people who do smart contracts, what is the relationship between them and those hard-working miners who are working subjectively for themselves and objectively for others? Therefore, the logic that the consensus is based on the supply chain is wrong. Those participants in smart contracts and miners, and the people who keep the accounting records are two different sets of people. Why should we run this here? And the consensus of each group is not the same. China’s village officials are a simple majority, and the US presidential election is an electoral system. We all know that the electoral system is the equivalent to the United States federal government. Independence led to this system, which says that as long as 51% of the country chooses one candidate, then he will represent 100% of the country. If you follow a simple majority, Hillary would have won. According to the electoral system, Trump wins. The election of village officials in China is a straightforward simple majority, so this consensus is not the same. How can we write this consensus together? This consensus is different. Does this have 21 super nodes or 7 mains? It is also different. This is a system. What is the relationship if there is 7, 11, or 21? If you set 7, then it’s 7. Set 21, then it’s 21. If people decide on one way here, and another way there, then it’s multiple consensus websites. Of course, there are more websites that are traditional websites. Traditional websites that have IDs, scarcity, and verification, are already much cleaner. So why do they need to have consensus? This site sells books and users can find non-fake books here. This is not enough, though. The site must have a consensus. While these four capabilities — ID, verification, scarcity, and consensus — are great, what is thing that is even more important? Decentralized mediation. This accounting book is not a decentralized intermediary. It is simply building trust. Can one person do decentralized mediation, and is one person able to to distribution? No. Actual decentralized mediation is when people work together to do this. This is the fifth point. Imagine someone writes a blog, and someone reads the blog. But there is a company called Facebook, and they are manipulating things. This is an intermediary operation. How do we create a service like Facebook? Someone writes a blog, and you are here, write to the cloud, put your data on it, then that person writes something and puts it on the cloud, and then I want to get on Facebook, and I click through Facebook to get to the Blog. This service does not save any data. It is like a computer that has built a Facebook program. But when you look at this channel, it connects this person’s D drive to the computer, which is equivalent to the computer’s D drive plugging in one by one. There is no data on this computer, that is to say this data is only on the C drive. The C drive releases a program. When users use it, it is mapped to the D drive. When clicked, it is mapped to the E drive. Such a program is called a service that does not save and use data. It is just the opposite of the current cloud service. Today’s cloud service collects all the data on itself, from where it could be used for nefarious things. Now, we just put everything there, because the network is fast enough. When users visit the site, it’s all P2P so they can pass through. What we will talk about is operator evil. This is not a blockchain thing. This is a P2P network thing. This is also a P2P network. This is called a blockchain computer. It is a dedicated bookkeeping machine. This network is P2P. It is a computer’s internal bus. The copper wire inside the Galaxy machine. The fiber inside the Galaxy machine is called the main wire. There is a very strange name. The copper wire that the people see is called “king.” The line that the programmer sees is called the main wire. Therefore, at the time there were new structures and mesh structures at the time. These were the things the hard-working programmers had to care about. These main wires are things that the layperson should not know at all. So, people should not have to worry about the details of a P2P network, but you should understand its benefits. This network will remove the evil part of the central operator. We will eliminate this mechanism from the system. The last one is even more unexpected. Originally it was the C drive, E drive, one computer has 26 drives. We think about Tencent computers, or future network computers, we use a URL-like thing directly. These two points, remember Microsoft’s C drive, what does this slash mean? A slash is the ROOT of the local hard disk. What are the two slashes? Two slashes are ROOTs for the global Internet. Because UNIX uses a bar locally, two bars represent the ROOT of the Internet. This is around 1986 or earlier. I have seen it since 1986. Since I did not use the C drive at the time. Of course, this can represent endless possibilities. Everyone on the Internet can have a drive of their own. Not like Microsoft where one computer has 26 drives. Now, Internet computers can have an infinite number of drives. Let’s talk about the sixth one, which is software evil. I made a short video, wrote an e-book, or wrote a PDF. I told the media to broadcast 10,000 times, and to give me a piece of that revenue. Whether it was broadcasted 1 million times, or broadcasted 10,000 times, will they really tell me the truth? Certainly some people do not tell the truth, but most people tell the truth. The first time something is pirated, the CD is purchased directly, or copy a file. Second time something is pirated, the media player will not tell the truth. When you think of software, most of the data is played by a program, so the program has the potential to do evil, like stealing your book, and backing it up to its server. Or maybe it added a virus advertisement to you. That program should not transmit anything to you. This is not related to the blockchain. How do you get rid of the evil of software intermediaries? Have you ever wondered if we only have programs and no data? e.g. let’s say I give you a PDF, I make a website, create a tool, what I feed in is data, and then give you an ESE. This ESE is your content. For example, if you were originally a movie, then you give it to me, and I create an ESE. The ESE you play is a movie, with the same buttons. If you are a computer science student at Tsinghua University, you should be able return this assignment to me one week later, and the tool should be able to do a good job. If we went to the App Store today, and I’ve tried this, there is a software in the App Store called “White Deer,” which is an e-book. Of course, you have a PDF e-book version of “White Deer.” So I ask what is the difference between these two? I can download a game in the App Store, called “White Deer,” which is just to read this book. Another is a data file, which is easily copied and taken away. Wherever you advertise the game “White Deer”… do you put them in Beijing or Shanghai locally, the author of the game knows it. Although the beneficiaries are all “White Deer,” the beneficiaries are still different. The media player and the intermediary takes up the bulk of the sales, and the author takes what is left over. The author has the right to choose how much to charge and who has the leading advertisement. For example, when he downloads from Apple, whether he sets the price to $10 or $100, the income model will be different. The percent he retains scales differently, so where is the problem here? By sending you an ESE, the author can get more benefits, plus turning data into a program is a very simple matter. Why doesn’t this happen more often today? The simple truth is that today I can turn “White Deer” into a program and turn it into an ESE on Windows. I’ll email it to you. No problem. I could do it 20 years ago. Who dares to open it? You know what I’m talking about. Turning data into programs is very simple logic, but because no one dares to open today’s operating system, it leads to the media player doing evil. Who will put an end to this? It is the new generation of virtual machines that do not have daemons, drivers, or Internet access. In other words, just like Java Virtual Machine can run on Windows and UNIX, what are the two problems with JAVA? JAVA is very good, Android uses it, but JAVA has two problems: the first problem is that JAVA cannot run 100% of the program, even though JAVA is Turing complete. Turing complete is infinitely fast, but today’s real world does not need infinitely fast. JAVA is not fast enough, so the game engine, the codec, artificial intelligence, and deep learning all need to use C to write, because JAVA can not. Some blockchain startup companies are saying that they are Turing Complete, so they can write any program. This is blowing smoke. Java can’t write any programs. If it writes a bad script, can it run an endless amount of programs? The first problem is that if you can’t write the entire program, you’ll have to use JNI, which has daemons, viruses, and a network. All the problems are now back. So, we just can’t let the program go to Linux. Although Linux and the physical network are both available, we just can’t let it come down, so we’ll make a C++ virtual machine. The second question: JAVA has been compiled, called .class. C++ program has been compiled, called .OBJ. JAVA has been compiled, called .class. Let me face the camera. I hope that there are still several people watching in China. Then, after learning the theory of integration, .class is basically equivalent to a set. The basic equivalent of .OBJ is the element. The element and integration are not a single concept. One is an integration, and the other is an element. So the integration scope is more powerful. With this class information, RPCs can be automatically generated and all network packets can be generated automatically. You have enough information here, but over there you do not. It’s like you lost your code notebook, so you can’t solve the code on that side. He can send you something, but you can’t receive it. You must have class information on both sides, before you can automatically generate the network package. Everyone does JAVA on the terminal, and not on the server. Or on the service provider, but he did not use this technology. Microsoft designed .NET, and created the JAVA language. The core meaning is that although our network is similar to the original, the difference being that it does not have a .com, it is now decentralized. However, we should emphasize that although there is still TCP/IP, HTTP, VTN, and some UDP, we only let one person use it. Originally, all your applications would use TCP on their own. Now, all the protocols are for one person only. That is this operating system. All of them send packages. Only the operating system can have the right to send packages. Any application, any service, or any LT devices are not allowed to access the Internet. This Internet is clean and safe, which is why Microsoft will disband the group. If Huawei does not understand this matter, they will be in trouble. The whole blockchain is a potential energy. That is, the blockchain itself doesn’t have the power, but it makes it possible to make the Internet clean.